The average cost of assisted living in Terre Haute is $3,437 per month. This is higher than the national median of $3,345. Cheaper nearby regions include Paris with an average starting cost of $3,302. To help you with your search, browse the 7 reviews below for assisted living facilities in Terre Haute. On average, consumers rate assisted living in Terre Haute 3.7 out of 5 stars. Better rated regions include Brazil with an average rating of 4.8 out of 5 stars. Caring.com has helped thousands of families find high-quality senior care. 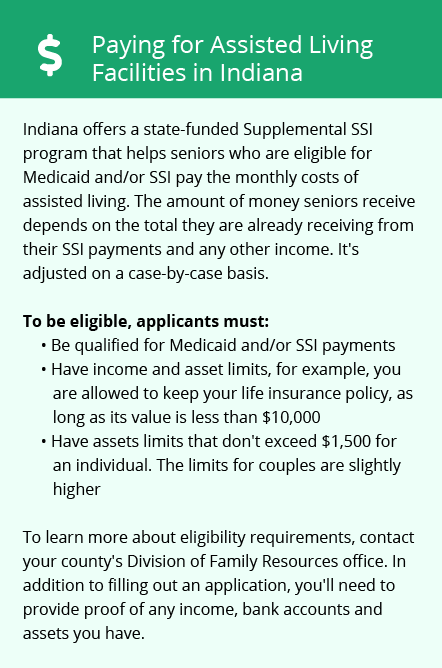 To speak with one of our Family Advisors about assisted living options and costs in Terre Haute, call (855) 863-8283. Terre Haute is located in western Indiana and is home to several universities including the University of Indiana. There are three assisted living communities in Terre Haute located just outside of town. 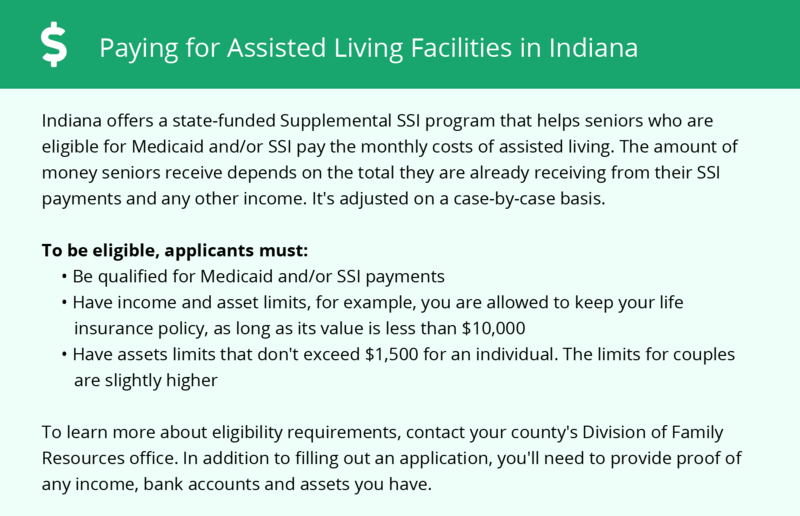 Indiana has two different options for seniors in need of assisted living services: assisted living facilities (ALFs) and residential care facilities (RCFs). ALFs offer basic services such as help with the normal activities of daily living and daily meal service for up to three meals per day. These communities have to register a disclosure form with the Family and Social Services (FSS) Division of Aging. RCFs offer these services as well, but they also provide residents with help administering medications and basic nursing services. RCFs are licensed by the Indiana State Board of Health Facility Administrators. Terre Haute Transit operates the city’ public bus system. Seniors are eligible for discounted single-ride rates. Even though Terre Haute’s overall cost of living is lower than Indiana’s average, the cost of things like groceries and health care is slightly higher than the state averages. This could make it difficult for seniors on a low or fixed income to find affordable options. Indiana is a state that’s considered moderately tax-friendly to seniors. Social Security income is completely tax-free, but withdrawals from retirement accounts and pension payments are taxed at the state’s full rate of 3.23 percent. The Terre Haute area is home to world-class medical facilities, including Terre Haute Regional Hospital, Union Hospital and VA Terre Haute Clinic, in the event of medical emergencies or illness. More than 99 percent of Indiana’s communities have crime rates lower than Terre Haute. While this is to be expected with larger cities, Terre Haute’s combined violent and property crime rates are also significantly higher than those in similar cities. Terre Haute’s moderately warm springs, summers, and autumns make it easy for seniors to enjoy outdoor activities on a regular basis. Assisted Living costs in Terre Haute start around $3,437 per month on average, while the nationwide average cost of assisted living is $4,000 per month, according to the latest figures from Genworth’s Cost of Care Survey. It’s important to note that assisted living rates in Terre Haute and the surrounding suburbs can vary widely based on factors such as location, the level of care needed, apartment size and the types of amenities offered at each community. Seniors who need help financing their monthly assisted living costs can apply for the Regional Care Assistance Program (RCAP). Additionally, the state’s Medicaid Waiver program helps cover the cost of residing in a RCF. Terre Haute and the surrounding area are home to numerous government agencies and non-profit organizations offering help for seniors searching for or currently residing in an assisted living community. These organizations can also provide assistance in a number of other eldercare services such as geriatric care management, elder law advice, estate planning, finding home care and health and wellness programs. To see a list of free assisted living resources in Terre Haute, please visit our Assisted Living in Indiana page. Terre Haute-area assisted living communities must adhere to the comprehensive set of state laws and regulations that all assisted living communities in Indiana are required to follow. Visit our Assisted Living in Indiana page for more information about these laws.